Striker Craig Mackail-Smith insists Hatters can still achieve something special this season despite their stuttering league form. Luton have dropped to 14th in the table recently after suffering back-to-back defeats and are already six points away from the play-off places. 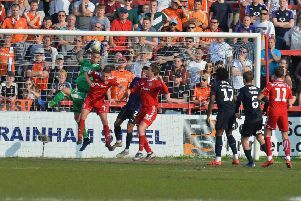 But Mackail-Smith, who has won promotion a number of times in his career, is confident that becoming a League One team next season remains very much within Town’s reach. He said: “We’ve started and then we’ve stopped, we’re getting to the point of doing something special and then we fall away and have a couple of bad results. “It’s hard to put a finger on why, but it’s probably a lack of concentration. “We know we’re still very much in with a chance of doing something very good this season. Hatters are at home to third-placed Northampton on Saturday, before visiting Exeter the following weekend. They then host Wycombe Wanderers and travel to Portsmouth over the busy Christmas period, playing four teams who are above them in the standings. However, Mackail-Smith believes that could be just what Luton need to get back on track. He continued: “It’s a fantastic time for us because the teams that we’re playing are above us and around us.